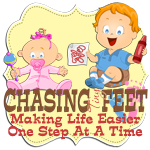 Chasing Tiny Feet: Silly Elf! Looks like our Elf wants some of Mason's St. Nick Day treat! St. Nicholas Day...What treat did your kids get?